PC Expo 2000 began with the VisorCentral crew arriving on Monday (eventually, as James' connecting flight got cancelled. After getting on the Judge Mills Lane show (look for us on it in September), we went back to the hotel and planned our strategy for the show. Let the adventure begin! 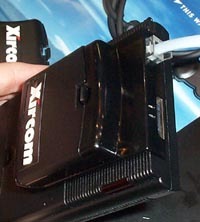 Xircom has four Springboard modules that are currently under development. The SpringPort Modem 56 GlobalACCESS will be the first one to be released. This 56k modem has a cellular phone connector and comes with AvantGo and MultiMail. No dongles here - instead there is a recessed jack for your RJ-11 cable. The SpringPort Modem comes with a 3AAA battery pack that can be replaced with an optional lithium-ion battery pack that can be used with any of Xircom's modules at a cost of $50-$60. The SpringPort Modem is due in August for $149, while the other Xircom modules (Ethernet, Bluetooth, 802.11) are due this fall. 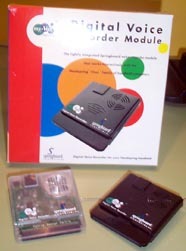 Shinei Technologies has two Springboard modules under development. The My-Vox voice-recording module can record up to 8 minutes of audio and has a quick-record button, an integrated speaker, and an included earphone jack. The module is pricey at $69.95, but has a very cool feature - voice alarms. I can record a quick memo "Call Marcus," and then when the alarm goes off while driving home I can hear what I'm supposed to do instead of trying to read the Visor while driving - a dangerous prospect indeed. My-Vox is due at the end of July. One of the few surprise Springboard modules today was seeing the fully-functional my-Raydio module. This FM radio module has 24 presets and can scan the FM spectrum to program the stations. The module can work in the background while you are in other applications and will also function while the Visor is off, saving the batteries while you're listening to tunes. My-Raydio comes with earphones and is also due at the end of July. The CUE Radio also utilizes an FM radio, as well as providing one-way paging, real-time traffic reports (in selected cities), news and email. Battery life is 4-6 weeks for data, or 12-14 hours of radio use. The pricing plan will be $15 for 100 messages. Earphones will also be included. The module will be shipping by the end of the summer for $159 in retail stores and online.